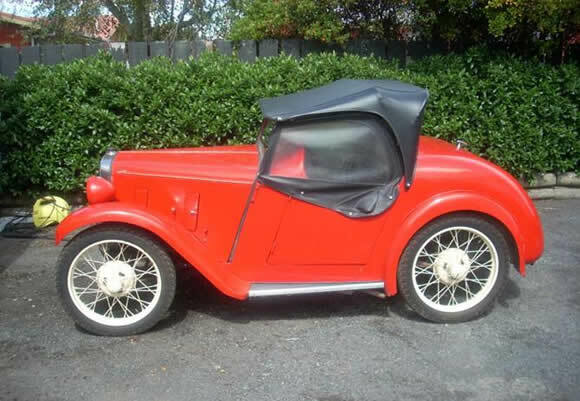 I saw this Baby Austin on Trademe and it reminded me of one my dad used to tell me about. Baby Austin's are very small cars. Just over 6ft long and weigh around 600 kgs. Not considered the manliest of cars in America they were the equivalent of today's hot hatches and did very well in competition, especially with supercharged motors, because they were so light. I've been told the racer built by a friend of dads, Ian Joynt, revved to 13,000 rpm like a motorcycle engine. Never having been in it I cannot say for sure how fast it goes but I'm assured very fast. Easily doing 100mph. Not sure how it held together at 13,000rom but it still runs to this day and has a beautifully hand built aluminum body. A beautiful little car that saved Austin from going under the Baby Austin's are fantastic to see and hear run. Check out this barn find Austin here. Great story and I saw these pics on Flickr. Amazing. Love the Green Special. Pigsty Racing having been building fast Austin's for 30 years. Their website is http://pigsty-racing.com/.